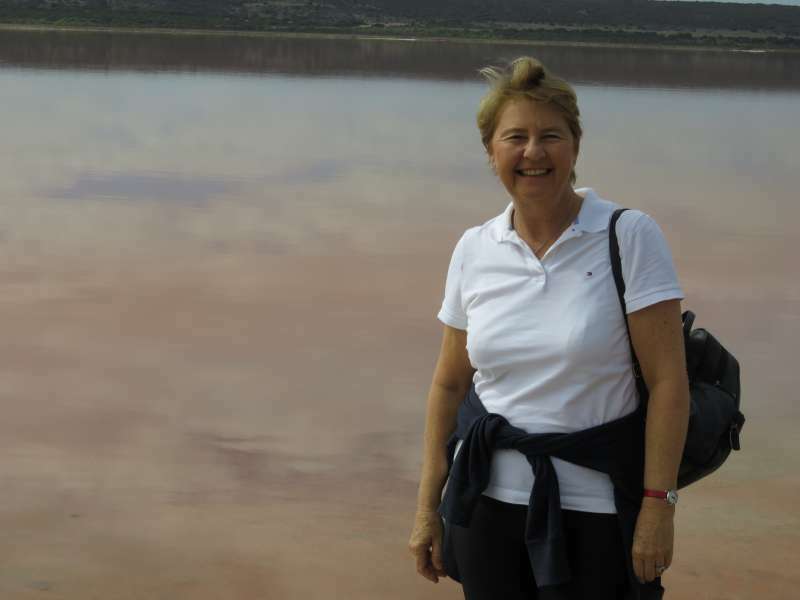 The Travelling Lindfields: Hutt Lagoon, Western Australia: A pink lake you can drive to. 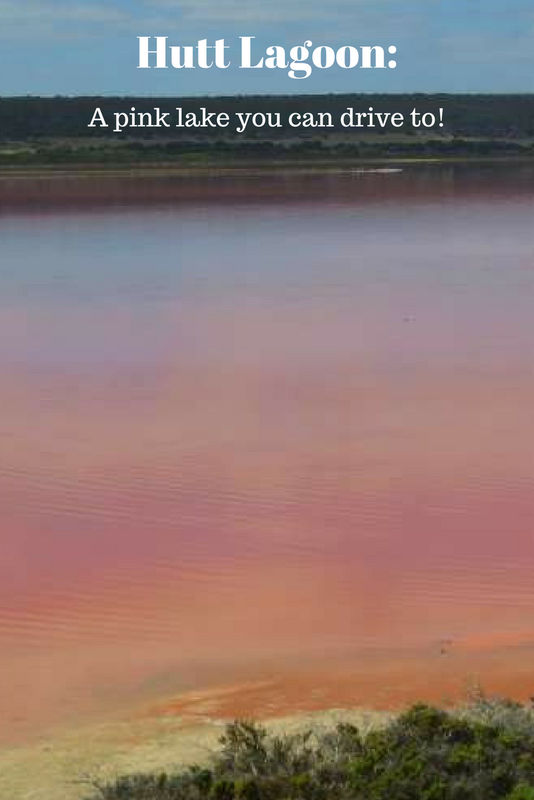 Hutt Lagoon, Western Australia: A pink lake you can drive to. Hutt Lagoon near Port Gregory on Western Australia's Coral Coast is a brilliant effervescent pink - or at least parts of it were on the day we visited. I have been chasing pink lakes for a while now and I finally found one which is easily accessible. You might remember, last year David and I went all the way to Esperance on Western Australia's far south-east coast looking for pink lakes and sunbathing kangaroos. We lucked out on both scores. You can read about our search at Esperance: Pink lakes and kangaroos on the beach. This time we hit the jackpot. Hutt Lagoon was a bright shiny pink, just sitting there waiting to be instagrammed. There isn't really a lot you can say about a pink lake, other than the fact that it is pink, so I will confine this post to a few facts and photos. If you do ever decided you just can't survive for another minute on this planet without tracking down one of these natural curiosities I can recommend Hutt Lagoon, if only for ease of access. Hutt Lagoon is on the coast of Western Australia, an hour north of Geraldton and five hours north of Perth. Head out of Geraldton on the main highway toward Carnavon. After 52 kms take Port Gregory Road toward Port Gregory and Kalbarri. The lagoon is 42 kms from the turn-off. George Grey Dr toward Kalbarri runs along the eastern shore of the lagoon while Port Gregory Rd runs along part of the western shore. Port Gregory Road has a couple of safe places where you can pull over, park and walk right up to the water's edge. George Grey Drive doesn't have anywhere to stop safely. 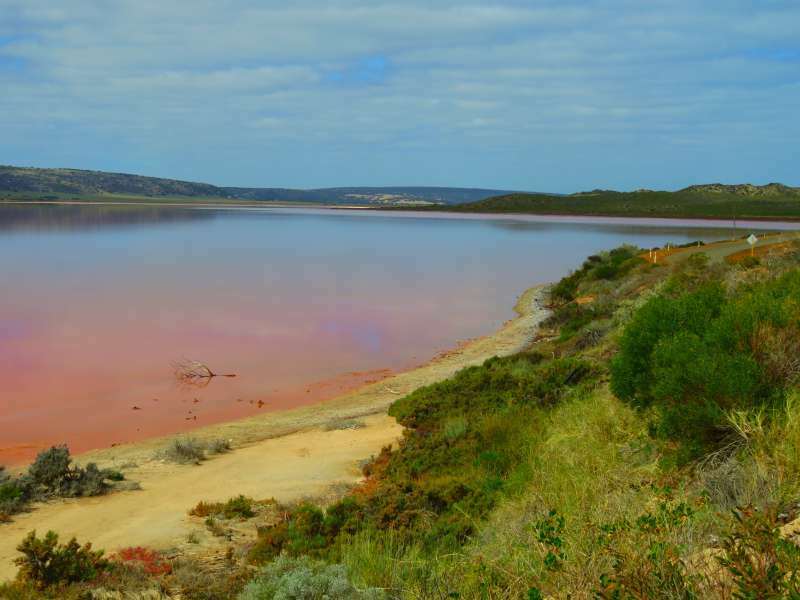 The pink colour is created by algae or possibly bacteria, according to Google and Australian Geographic. I am no expert, so if anyone has another theory I am happy to listen - pink hair-dye perhaps, or Martians, or locals creating a tourist attraction! The colour of pink lakes vary with the season, cloud cover and the time of day. As you can see from my photos the colour of the Hutt Lagoon progressed from purple to bright pink in the short time we spent there. I have read the lake is most vibrant at mid-morning and sunset. We were there mid-morning on an overcast day. The sun came out just as we were leaving and the lake seemed to be pinker under a blue sky. Some parts of the lake were much pinker than others. Can you fly over it? Yes! Click here to book a flight. (Note: If you follow the link to book your flight I will earn a small commission). Me - just to prove we were actually there! I have never seen a pink lake. It's almost the polar opposite of the turquoise glacier fed lakes here in Western Canada. How great that you found it and with easy access. The glacier lakes are prettier but pink lakes are worth seeing just because they are so unusual. I believe bacteria colors the lake, as I once saw on a Nat Geo show. Or read online. Or saw it somewhere LOL. I also dig the name too; reminds me of Jabba of Star Wars fame. Haha - I didn't make the Star Wars connection, even though I am a fan of the films. I think you are right about the bacteria thing. The cause was once thought to be algae but now it's bacteria or vice versa or something. I hope you see it one day. 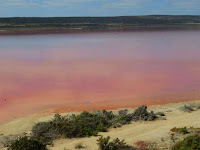 There is also a pink lake on an island off the coast of Esperance. You can fly over it but I don't think you can go by boat. Is Lake Taupo pink? We have been there a few times and I never noticed any unusual colour. Do you have to be in a particular spot to see the pink colour? It isn't that far from Perth, only about five or six hours which isn't much given the vast distances between towns in Western Australia. I have not yet seen a pink lake but I have seen algae blooms that are red / pink. 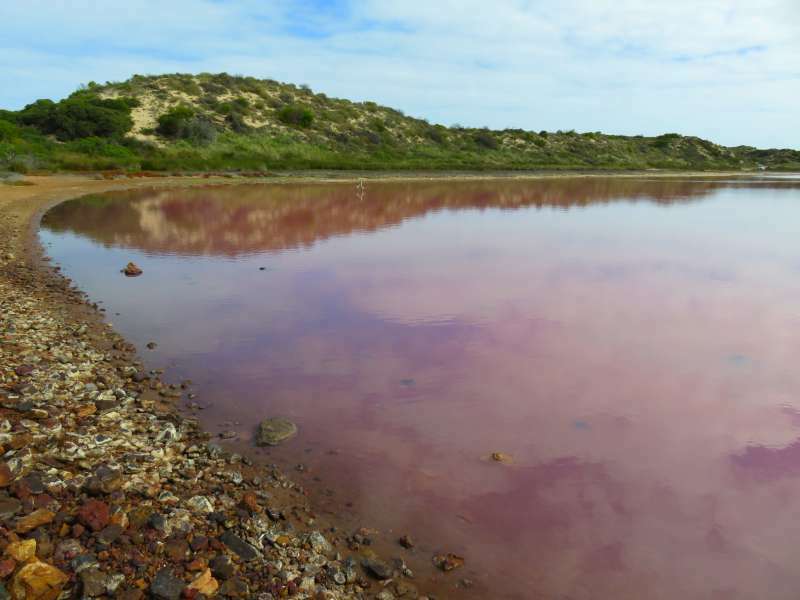 I would like to visit a pink lake like Hutt Lagoon someday. I think the closest thing to it I've seen is in the geothermal regions of New Zealand (all sorts of brilliantly coloured water). The geothermal regions of New Zealand are stunning but quite different to Western Australia's pink lakes. A pink lake we can fall in love with ! I read this morning, on another blog, that the pink lake in Yucatan is that colour because of pollution from mining or industry nearby. I am going there in early 2018 so stayed tuned. Hutt Lagoon is an entirely natural phenomenon. The Hutt Lagoon certainly looks great for photographing! With all the algae and bacteria, can you go swimming in it or is it just for looking at? Would definitely love to visit Australia some time and add this to my places to visit. I don't know if you can swim in it. It was a bit too cold for swimming when we were there. I don't think it would be dangerous but there is a great beach just down the road so I don't think anyone would bother. Oh, I've never been here or knew it existed (I'm West Australian) is it near Hutt River Province? Funny you should mention Hutt River Province. I meant to say something about it in my post but simply forgot. I will put it in when I do a round-up post on our whole road trip. The entrance to the province is about 45 minutes away. I was tempted to go there just for the laugh factor but we had a long distance to drive (not surprising in Western Australia) and just didn't have the time. I remember lining up with other crowds to see Prince Leonard when I was about twenty and he visited the Gold Coast. I was on a holiday with my mother and she wanted to do it. It was ridiculous but one of those things you do just for fun. I googled the province while we were in W.A just to see if it was still there - and it is. This lake looks beautiful ;-) Is it safe for swimming or too much bacteria? Someone else asked the same thing. I have to be honest, it didn't look very inviting so the idea of swimming in it didn't occur to me. It is very close to the coast and there is a great beach a few minutes drive away. One day I would like to do a scenic flight over one but the pink colour varies with lots of weather related factors so you would have to be lucky to get the kind of photo you see on the internet. I agree. My problem is that one isn't enough. Now I want to see another one somewhere. So I have an entire bucket list dedicated to seeing the bizarre color pink in the world. I have 3 items, a Pink Beach (there are actually several in the world), a Pink Waterfall (hidden in Canada), and a Pink Lake like the one you found in Western Australia. How cool but kind of bizarre. Can you imagine the first people finding this? 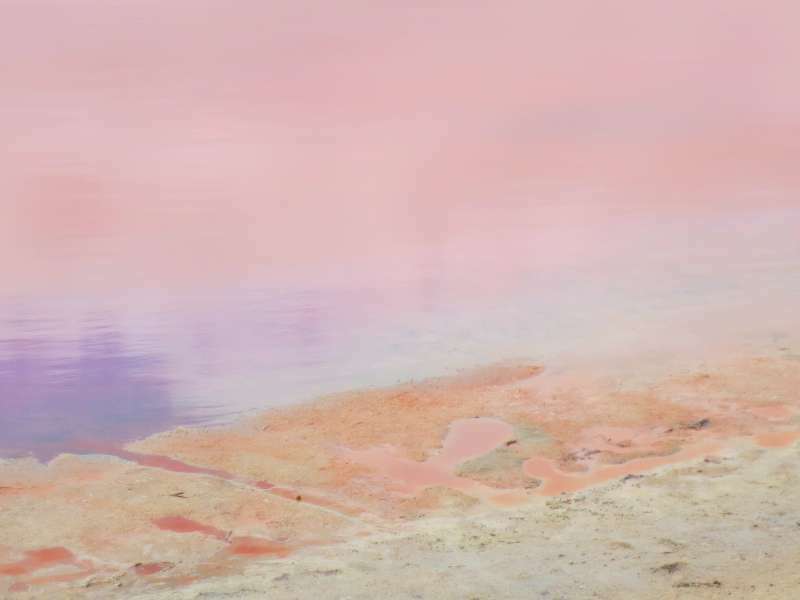 I read recently about a pink lake somewhere in the Caribbean which sounds pretty amazing. Love the idea of a pink waterfall. I visited Hutt Lagoon years ago when I was a kid, I still remember being in awe of it though! Such an awesome place to visit. Wow. It is great that it is still pink. Apparently the colour can disappear in some lakes. The inaccurately named 'Pink Lake' at Esperance, for example, hasn't been pink for years. I believe the pink is caused by bacteria or algae. Whatever the cause you are right about it being lovely to look at. Don't think I've been to a pink lake, but I am intrigued... if I am ever up that way I will definitely take a detour! Western Australia has a couple of pink lakes. There is another than I know of on an island off the coast at Esperance. I always expect to see flamingoes around a pink lake. I don't suppose that would happen in Australia though. Beautiful photos, Lyn! 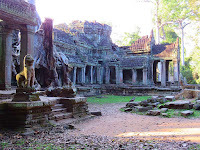 Thanks for linking in this week, #wkendtravelinspiration! There is a lake in Yucatan, Mexico which I gather has flamingos and close by there is a pink lake. I am going there next year so I will let you know. The shame is that the pink lake is the result of pollution from a mine or something rather than a natural phenomenon. 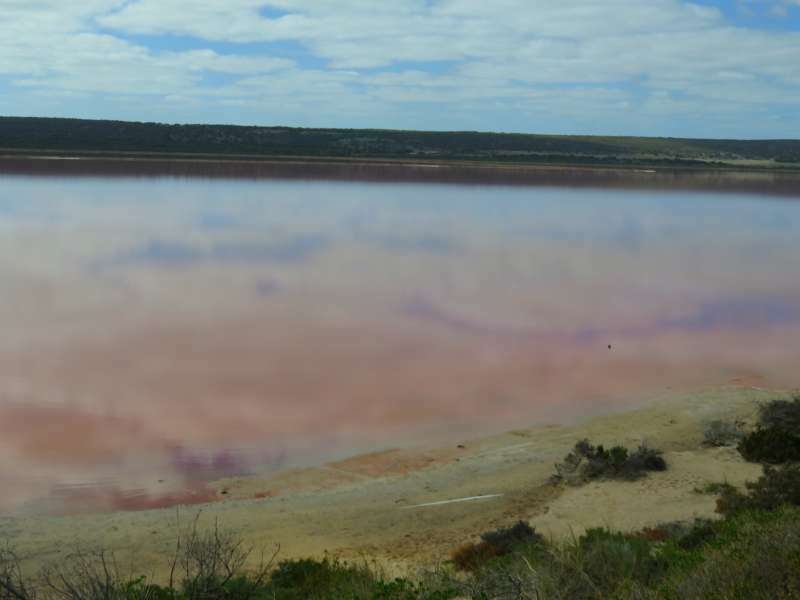 I learned about the pink lake in Esperance earlier this year. I didn't know there were more! Cool! Seeing a pink lake for myself is on my list. I hope you get here one day. I am sure you will love it. What lovely colours - great for a photographer! It reminds me of some of the strangely coloured lakes in New Zealand. The only coloured lakes I have seen in New Zealand are the geothermal lakes. They are stunning but the cause of their colours are quite different to Australia's pink lakes. I can see why pink lakes draw you. They are so unusual and the color changes with the light. We were supposed to go to Kalbarri when we were on the west coast but cancelled it because we only had 2 days 1 night for a RT from Perth. It seemed to short. If we come to Australia again, I would like to spend more time or all of our time exploring the West Coast, as it is quite different than anything else. Then we could go see this lake. We drove through Kalbarri and had a picnic lunch there. The coastline is stunning - red rock cliffs. The National Park apparently has some great gorges but we didn't have time to see them. I've always wanted to see a pink lake in person! They look absolutely unreal. Is any marine life able to live in that lake? I don't think the algae or bacteria is poisonous. As far as I know marine life co-exists quite happily with the colour - but don't quote me on this, I am no expert. HI Lyn! Western Australua seems to have a lot of cool stuff to discover. The pink lake is just one of them! Thx for sharing. Western Australia is the most amazing place to explore. I could easily ditch travelling in the rest of the world and just keep going back there. I don't think it is unsafe for swimming but it didn't look especially inviting either. There is a great beach just down the road. One day I would love to fly over one but driving past was almost as good. Yet another thing to add on my West Coast Must See list! I love the martians theory about why the lake is pink haha! I suppose it's not chemicals? Just in case I wouldnt be dipping myself in that haha! Take your swimmers and hit the beach just down the road. It looked much more inviting. You put me to shame, living in the west all my life, you have seen more of the state than me. But our aim is to travel much more locally when we retire. I look forward to reading your posts. W.A is not an easy state to see, especially if you don't camp. One day I would love to see The Kimberley again, maybe on a small cruise ship.